The instruments is supplied with laser centring device and motor-controlled sample holder for the displacement of the part to be measured. The sample holder moves the test piece under the laser centring tool and then places the optimal test point of the part under the micro-irhd testing unit. The positioning and hardness measuring is performed automatically without intervention of the operator. The instrument is conforming to ISO 48, ASTM 1415, DIN 53 519-1/2 standards. The instrument permits to perform the measure of micro-irhd hardness of o-rings and small parts eliminating the human influence in the sample positioning. O-ring or small parts with thickness between 1 and 20 mm can be tested. The laser testing process can be stopped to perform tests with standard samples. The software for the control of the instrument includes a ‘Scan’ function which permits to record the laser reading of the profile of a piece and to define the position where the test has to be made. The test setup for each product is stored and is automatically re-used when the same product is tested again. 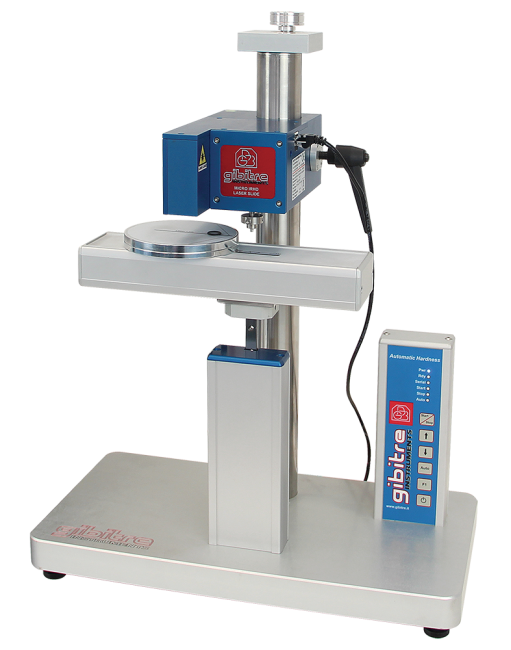 The micro-irhd testing units produced by Gibitre measure the force applied to the sample using a load cell. This technology, widely used for the hardness testers for metals, permits to eliminate the effect of friction in the application of the force and improves the test repeatability. The laser sensor used is class 2 type and has 0.001 reading resolution. The sample positioning disk permits to set the position of the test piece with 0.005 mm accuracy. The combination of accurate measuring and sample positioning devices ensures a very high repeatability of the results obtained even when very small parts are tested.